Identification: Upperside is dull gray-brown with a slight luster. Forewing above and below has 2 eyespots near the tip, usually in a red patch. 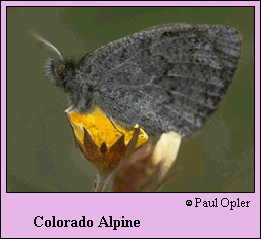 Underside of hindwing is silver-gray with tiny dark markings. Wing Span: 1 3/8 - 1 1/2 inches (3.5 - 3.8 cm). Life History: Males patrol over grassy areas to find females. Eggs are deposited singly on dead leaf blades near grasses and sedges. Flight: One brood from mid-July to mid-August. Caterpillar Hosts: Probably grasses or sedges. Range: Alpine Wyoming and Colorado.